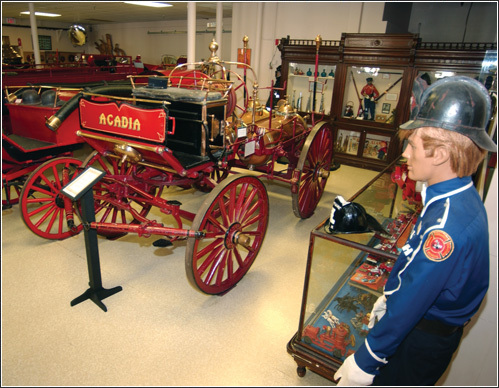 See the types of fire engines used throughout Nova Scotia from the 1800s to the 1930s. Marvel at antique, hand-drawn and operated engines, such as Canada’s oldest horse-drawn steam engine or an 1863 Amoskeag Steamer. Take the wheel of a 1933 Chev Bickle Pumper. Discover the history of Firefighting in this province through photographs, stories and thousands of artifacts. See antique toy fire engines, original uniforms and a huge collection of shoulder crests patches and badges from fire departments around the world. Antique auto enthusiasts in particular will enjoy the important collection of vintage equipment: the pumpers, hose wagons, and ladder trucks. Even though these fire trucks had long service careers before being retired, they're all in excellent condition, which makes perfect sense. Given that firefighters routinely risk their lives as part of their job, they always make sure the equipment they depend on is in good running order.